Millennials killed another department store! For those who buy into this hyperbole, it's only a matter of time until Amazon kicks down the door to eat up every last dollar that traditional brick-and-mortar stores stand to make. Yes, dark clouds may be on the horizon for some traditional retailers, but as we move into the new year, there are also rays of hope that are shining through the digital storm. Despite the rapid growth of e-commerce sales, approximately 91% of consumer transactions still take place in a brick-and-mortar retail environment (Statista Q3 2017). Retail stores are still vital to shoppers and will remain so for the foreseeable future, no matter how many times we're told Amazon is coming. That said, retail stores must evolve to compete in the digital age. An exciting trend that should give all retailers hope is the implementation of interactive digital signage. Making a strong in-store impression can last well beyond the front door to influence future purchases online. With 9 of 10 customers still walking into a store to make a purchase, how can the physical retail environment improve the overall retail customer experience in ways that shopping online cannot compete with? Here are 6 ways that interactive digital displays are improving the retail customer experience. Interactive displays in a retail setting allow the customer to engage with a brand at a deeper, more personal level. By inviting the customer to participate in the fun, a store becomes more than just a place to pick up a product—it becomes a branded experience. We are curious creatures by nature and welcome the opportunity to press some buttons. Retailers can find creative ways draw the customer into the experience through digital signage and encourage them to share their experience. In the digital age, information is a practically a form of currency. The modern consumer is more informed about their purchases than ever before. Provides customers with the information that they demand using digital displays to highlight product features and benefits. If you don't, your customer will likely pull out their smartphone to research the product online. If that happens, they may just find a better deal while they are standing in your store! Create an in-store experience that is so immersive and informative that they will forget all about that phone in their pocket. Information is a two-way street. How your customers interact with the digital displays is very valuable information to retailers. 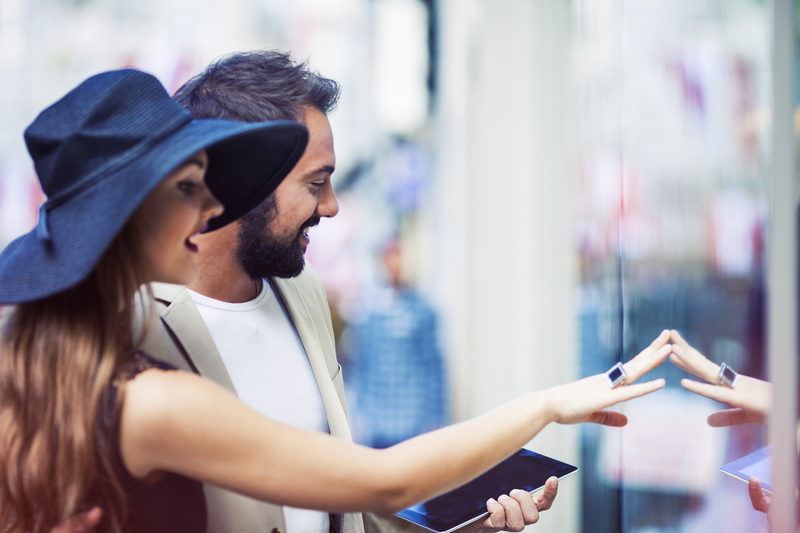 Collecting data on interactions with touch screen displays devices allows retailers to optimize their content and improve the customer experience. New insights can be drawn from the data that may help guide purchasing or inventory decisions. Or, prompt consumers with a quick survey with some small incentive at the end. This is a chance to learn about the customer to better serve their needs in-store and online. Retail digital displays can influence a customer at every level of the buyer's journey, from the outside display window to the point of sale. As part of an omnichannel shopping environment, interactive digital displays can help bridge the experience a customer has had with a brand online to the in-store experience. Digital displays and self-serve kiosks also allow retailers to create an additional point of sale to their online store all within the retail environment. The retail customer experience should be just that—an experience! Digital displays can create an immersive brand experience that builds trust and loyalty with your customer. Video is perhaps the most powerful storytelling medium and digital displays present a special opportunity to communicate directly with a customer at the point of purchase. Interactive displays are one way that the retail environment can keep pace with the dynamic pricing and promotions found in online shopping. Offers can be adjusted, removed, or updated quickly and efficiently through one content management system. Content changes can be made from the corporate or store level, depending on the retailer's needs. Meanwhile, the customer experience is improved because the most current information is on display. The opportunities to engage consumers through retail signage are numerous. If you are looking for innovative ways to improve the retail customer experience through interactive displays, or need fresh content to maximize your existing displays, contact RMG today. RMG is a global leader in intelligent digital signage and software, providing end-to-end solutions to the majority of Fortune 100 companies.